Preheat the oven to 425° F. Place the jalapeno peppers on a small baking sheet and bake until the skins are completely wrinkled and charred, about 20-25 minutes. Remove from the oven and place in a plastic baggie and seal. Let them sit for 10-15 minutes. Remove the peppers from the baggie and rub the loosened skin off of the jalapeños. Slice the peppers in half lengthwise and remove the ribs and seeds (or leave in for more spice). Slice peppers thinly and set aside. Preheat skillet over medium heat. Place the bread slices on a cutting board and use a basting brush to spread the slices of bread with 1 tablespoon of melted butter on one side of each slice of bread. Turn the bread over and spread cream cheese on 2 slices and place 2 slices of pepper jack cheese on the other bread slices (see diagram above). Place the jalapeno peppers and tortilla chips on top of each cream cheese slice. Then, top with the other side of bread that has the cheese on it (butter sides should be on the outside of the 2 sandwiches). Place bread buttered side down in the skillet over medium heat. Cover with a lid and let cook for 3-4 minutes or until golden. Reduce the heat to medium-low and flip the sandwich to the other side and cook for 2-3 minutes or until bread is toasty golden and the cheese has melted. The second side will cook faster than the first so watch carefully. Enjoy! 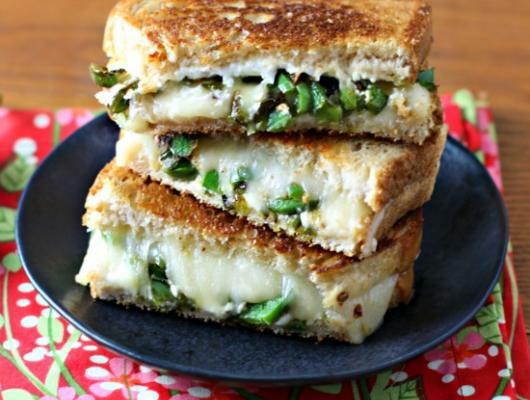 Jalapeño Popper Grilled Cheese Sandwich is like everyone’s favorite jalapeño popper appetizer melted between golden, buttery bread with 2 creamy cheeses and 1 crunchy surprise! 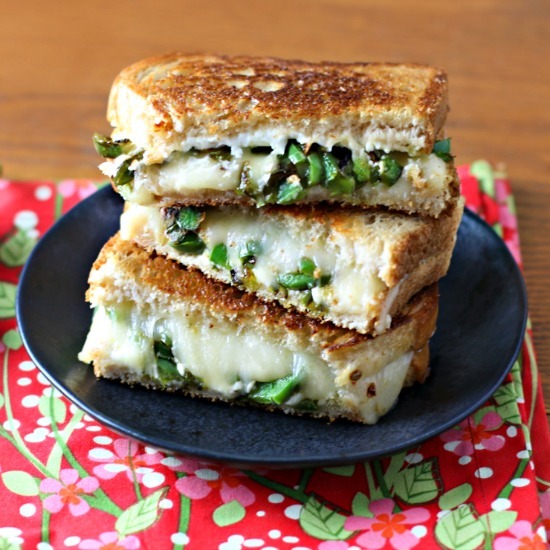 It’s the grown up version of the classic grilled cheese sandwich lunch meal!